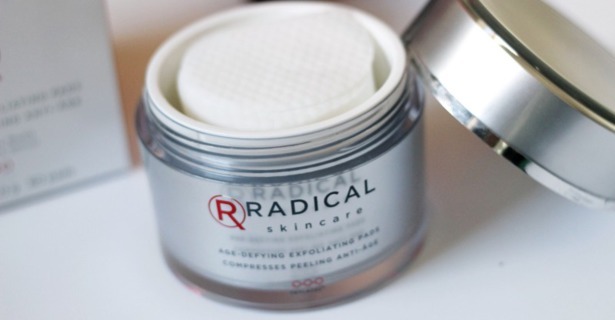 Here is a rundown of the amazingness of the Radical Skincare Age-Defying Exfoliating Pads**- $75 USD, and what they do- exfoliate, support natural cell turnover to help tighten and firm the skin, reduction of the pore size and lines, as well as preserving skin’s natural hydration and nourishment. Can you say AMAZING! With regular use of these exfoliating wonders, the excess sebum is removed while leaving the good oils of the skin to help nourish and hydrate the skin. Perfect for all skin types including sensitive skin while it is enriched with chamomile to help sooth and calm the skin. I mean a sensitive skin, exfoliating pad that is proven to reduce crows feet by 50 percent within two weeks. These pads are simply amazing. Housed in a huge silver jar, these pads are equally soaked in the age defying potion. Slightly textured in pattern, the pads are awesome. These pads felt like they would sting as they had a slight tingle, however they were super gentle on the skin. After using these for a few solid weeks, I have noticed that my skin is super soft upon touch. I have also noticed that my skintone is more radiant and even in tone. I am in LOVE with these exfoliating pads. A bit on the pricey side, these pads are $75 USD for 60 pads which should last about 2 months if used nightly or a bit longer if you use them every other night, but they are ooooooh so worth it. Hands down a must have in my current beauty stash, I am obsessed!